Below, connection wizard is shown to connect your database either on local host or remotely. MS SQL to MySQL Database Converter Software converts entire database or selected table’s records of MS SQL database to MySQL data base server. Software provides option to connect DB either locally or remotely. 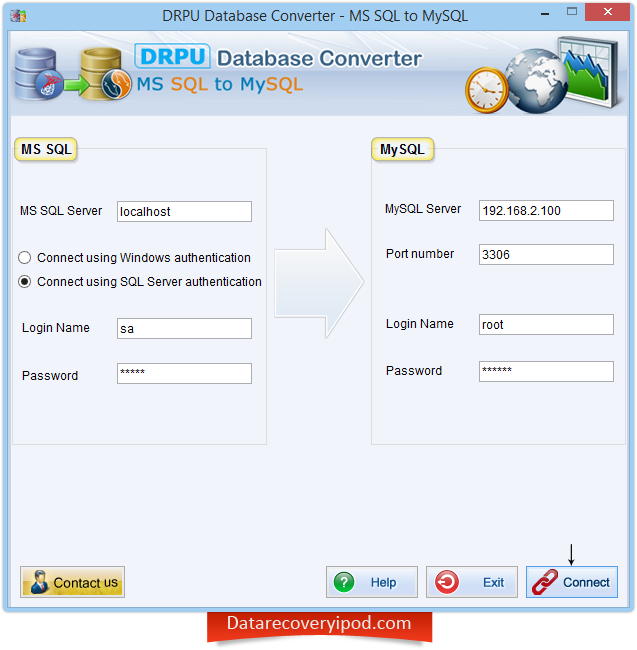 Microsoft SQL DB converter tool is capable of converting table definition, converting views and stored procedure. Software also provides option to skip indexes conversion. Data base converter utility facilitates users to overwrite the contents of existing MySQL database or save the converted MS SQL database records at new destination database. All major data types are supported by the database converter software including default values, null values, unique and primary key constraints of your MS SQL databases. • MS SQL to MySQL DB Software facilitates user to convert table definitions. • You can skip indexes conversion by checking this option during tables attributes selection. • MS SQL to MySQL database conversion utility is capable to convert views. • DB converter software converts stored procedure also. •	Database Converter can converts single table or entire database records. •	Converter Utility provides user friendly GUI (graphical user interface) interface.